Oh crap, brain has shut down due to the shiny. Can. Not. Function. 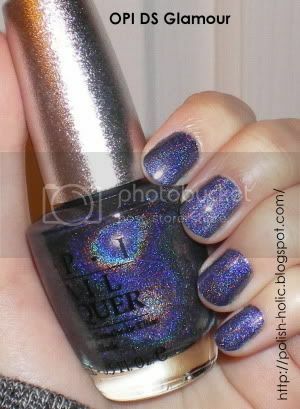 This polish is so amazing. It has so much dimension. Oh hello beautiful blue holo goodness. This is an old Designer Series polish that I had to get online, but oh so worth it. I couldn't quite figure out why the DS polishes were so expensive, but after trying this beauty out, I see the light. Literally and figuratively. It also goes on incredibly smooth. I'm actually a bit surprised at how smooth. Swipe swipe swipe and I was done. The brush also had great control. This is two coats, was a little bit sheer at one coat. The picture actually doesn't do the polish any justice. What's a better indicator of what it looks like when direct light hits it is the bottle. That's how my nails look. When out of direct light, it just looks like a shimmery blue.